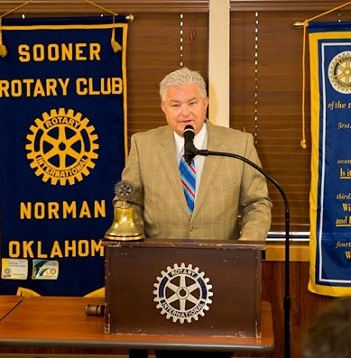 At Tuesday's meeting, we had a very special guest- Bob Barry Jr., KFOR's Sports Director! if you missed the meeting he told us how he got four fouls during a high school basketball game without even 1 second coming off the clock! Bob also told us about his passion for motorcycles until he wrecked a scooter in 2012 and spent 7 days at OU Medicine. He shared several funny stories from his experiences in radio and TV. Bob also spoke about the Thunder's new coach and his outlook for this upcoming football season!